China and Mexico have been put on notice once again: President-elect Donald Trump's new trade team doesn't like how they deal with America. 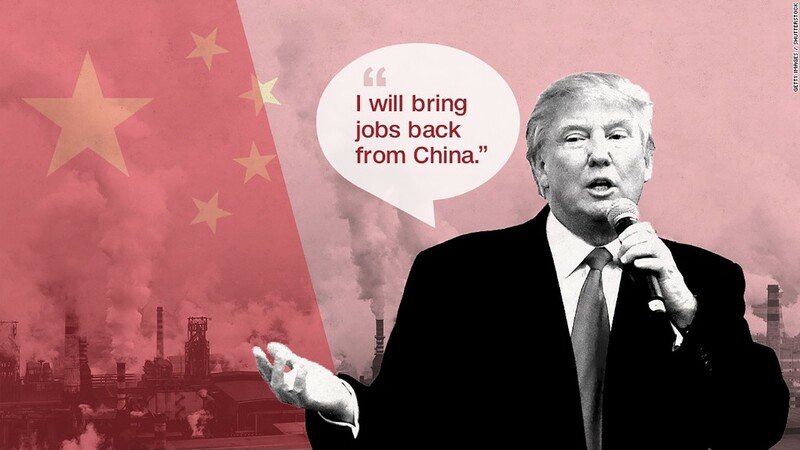 Peter Navarro, the economist tapped to lead Trump's newly created White House Trade Council, directed a documentary titled: "Death by China: How America lost its manufacturing base." And Commerce Secretary nominee and hedge fund billionaire Wilbur Ross once supported TPP, or the Trans-Pacific Partnership, because he believed it would isolate China economically. "China...could be heading for some difficulties if the Trans-Pacific Partnership gets approved," he said in August 2015. Ross has also said negotiating a new trade deal with Mexico is a Day 1 priority for the Trump team. The two also co-authored a paper where they called China "the biggest trade cheater in the world." Now, the president-elect is said to be considering a 10% tariff on all imports or changes to tax policy that could possibly level the playing field. 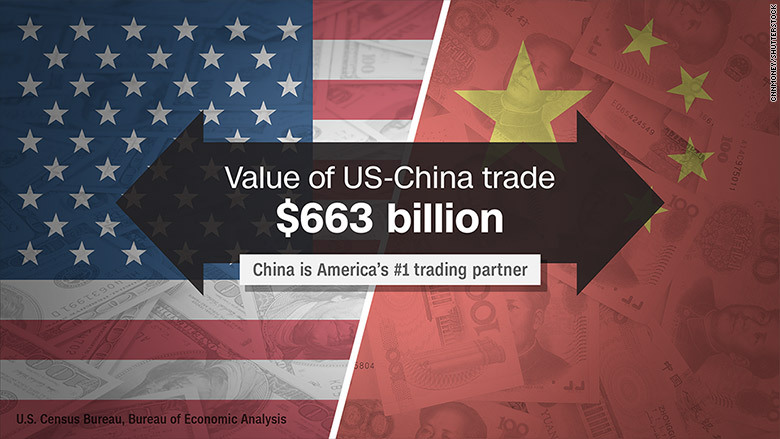 China and Mexico are among America's top three trade partners (along with Canada). There's concern that a tough stance would cause those countries to retaliate with similar measures and spark a trade war. Remember: America imports lots of everyday items. The top imports from China this year are cell phones and laptop computers, according to Panjiva, a firm that tracks global trade data. From Mexico, it's cars. Some see Trump's trade team as protectionist -- putting up hurdles on other countries to shield U.S. businesses. "They want to get rid of existing trade agreements [and] put up tariffs...Those are all protectionist moves," says Douglas Holtz-Eakin, president of the American Action Forum, a right-leaning think tank. A lot will depend on the details. "If they come in with a 5% [tariff], that's very different than 35%," says Derek Scissors, a China expert at the American Enterprise Institute. Scissors also thinks the response from Mexico and China will depend a lot on whether the Trump team takes specific action against those nations or does something across the board on all countries. At the end of the day, Trump wants U.S. companies to bring production and jobs back to America. Navarro and Ross appear to be considering at least two main options to accomplish that. Option A: Put up tariffs on other countries. Trump's transition team is floating the idea of a 10% across-the-board tariff on all imports from all countries, sources told CNN. Several trade experts say tariffs would raise prices on goods in America and risk U.S. jobs that depend on trade. However, Trump's team emphasizes that they're using the threat of tariffs to get better trade deals -- they just haven't said what a better deal looks like. So it's unclear if the tariff talk is more bark than bite. "The tariff is not an end game, it's a strategy -- a strategy to renegotiate trade deals," Navarro told CNNMoney earlier this year. "Tariffs wouldn't put U.S. jobs at risk." The other leading idea is a border adjustment tax (BAT). It's different from a tariff, which only affects imports. The BAT affects imports and exports. But it may serve the same purpose of making trade fairer for America. "If you think about it from a policy and objective standpoint it's addressing a lot of the same trade issues that were brought up on the campaign trail," says Bill Methenitis, director of global trade at tax consulting firm EY. In its simplest form, a BAT makes it more expensive for U.S. firms to import goods and less expensive to export by giving companies a tax adjustment. However, the U.S. imports far more than it exports and this would many of the goods on the shelves of Walmart (WMT) and Best Buy (BBY) more expensive. But those in favor of this strategy bet that it will increase the value of the U.S. dollar because foreign companies will buy more American goods and fewer foreign goods will be sold here. A stronger dollar will in turn make it cheaper to buy goods from overseas so it will cancel out any price increases on goods available in Walmart and Best Buy. In theory, you wouldn't see any difference in your grocery bill. But of course, the dollar trades in the free market and there's no guarantee the dollar reacts that way. Some experts say the BAT won't get passed because the World Trade Organization would oppose it. "There would potentially be big winners and losers," says Paul Ashworth, chief U.S. economist at Capital Economics.